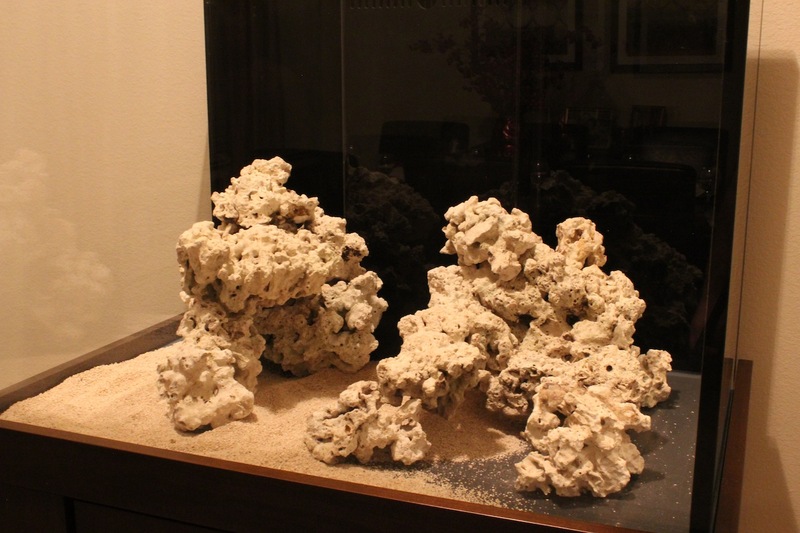 Easter weekend has been quite a busy one for our 90-gallon rimless aquarium. The Bulk Reef Supply Eco Pukani dry rock came in and we started the aquascaping process. As many of you could attest, this is not always an easy task. After all, the rock layout has to be perfect, right? So, for two days we played with the Pukani rock, breaking off a piece here, rotating a piece there, and even starting all over at one point. Prior to placing the rock into the aquarium, it was laid out on a towel on the ground so we could get a good feel of how the rock should look. Several rocks were drilled so that we could insert an acrylic rod into them. This would allow us to stack the rocks on top of each other, but still maintain stability. Ideally, I would have preferred to use a live rock mortar or some type of two-part epoxy to add more stability, but my lack of patience and the fact that neither of these items were available forced me to press on without them. Eventually, we settled on a layout that we feel represents the overall look we are going for, though I’m sure some minor changes will be made as this is usually inevitable. 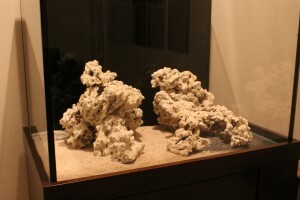 We wanted to go with a small amount of rock in an attempt to create a minimalist aquascape. The layout provides for plenty of swimming room for fish, lots of places to attach corals, and still quite a bit of space to put things in the sand. 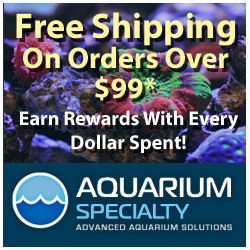 Please keep in mind that the pictures above show the aquarium without all of the sand in it. We’ve since added more sand to completely cover the bottom, but we plan on keeping the sand bed quite shallow.